As most of you know, we have a project and people close to our hearts. 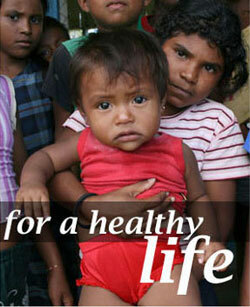 Our Miskito FRIENDS in the RAAN of Nicaragua need your immediate help. In their attempt to forcefully remove illegal squatters on their land who are taking their life line resources, the Miskito’s have moved their wives, daughters and young children to the regional capital city of Puerto Cabezas for safety reasons. Normally self-sufficient with small plots of rice, beans and vegetables, the families are now separated from their land and in need of our help to buy basic daily food needs until the issues are resolved. There are about 1,000 family members displaced waiting for the time it will be safe to return to their land. 100% of all donations will go directly to help those in need. For as little as $2.50 per person per day, we can provide 3 small meals per day. Please consider a tax-deductible donation. Click on the Donate button on the right to donate. Our Friends need your help. Please consider a donation of $10-$25-$50-$100 or more to help those in need. If you don't have a PayPal account you can click on continue on the donate page for other options. 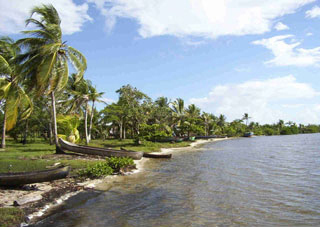 Here is an example of the typical shoreline on the east coast of Nicaragua. Some of the coastline boasts much larger beach areas and a beatuiful view of the Caribbean can be seen. The basic form of transportation from most of the communities can also be seen, it is called a panga. 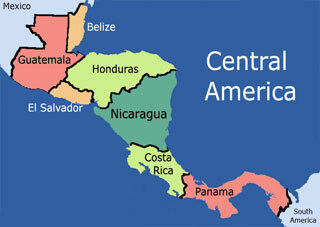 Nicaragua is located in Central America. It is the largest country in Central America. It has about the same land mass as the State of New York. 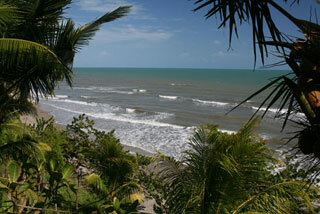 Aid4Nicaragua is working primarily on the eastern coast of Nicaragua. The primary inhabitants on the east coast are indigenous indians. This shot was taken looking over the railing at a local restaurant in Puerto Cabezas. There are many such views overlooking the Caribbean. This was taken during the rainy season and just after a storm had passed through. If you look closely at the picture you can see the clear blue water just a little ways off shore. This is normal after a storm surge and passes rather quickly.